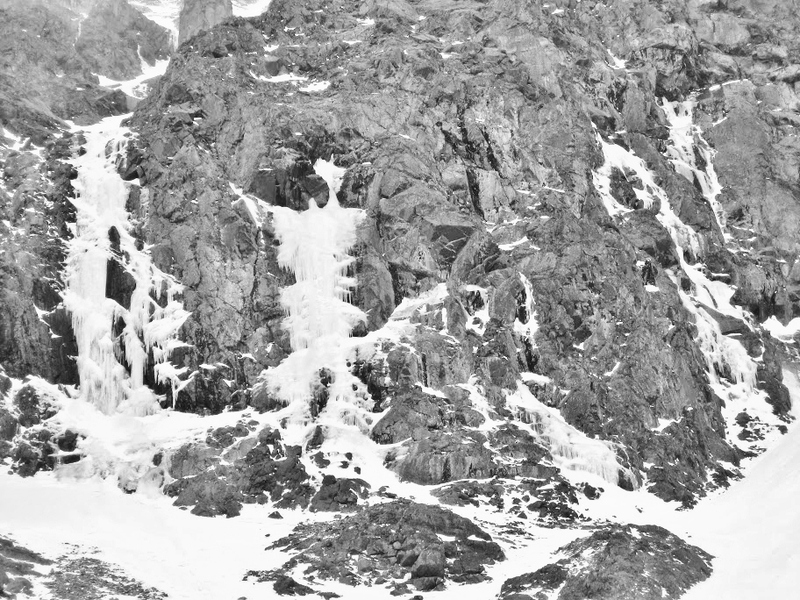 I shivered violently as I yanked the ice-encrusted ropes through the slots in my belay device. It was getting colder. The loop of slack disappeared as Olin worked his way higher on the second pitch, out of sight from where I crouched in the ice cave that my partner had already started calling “The Lair.” I looked down at the remaining coils of rope flaked out around my boots and realized that only about ten meters of slack remained before the line would come tight on my harness and I would have to start simul-climbing. There was no way to communicate with Olin; he was too high above me and the wind was gusting too strongly. Any attempts at signalling him by pulling the ropes would risk yanking him off the climb and sending him into a dangerous fall. A sudden sharp tug on the ropes interrupted my thoughts, and I thought I could just barely hear Olin yelling something. I paid out a small amount of rope, unsure if he was still climbing and in need of a little slack or trying to tell me to deconstruct the belay and get ready to climb up to him. A second series of tugs arrived a few seconds later, and I knew he had reached the top of the route and built a new anchor to secure himself while he belayed me up. I unclipped my own belay device and stood up on cramping legs. I badly wanted a drink of water, but the water bottles were at the base of the climb and probably frozen by now. An ice chip from the floor of the cave would have to do for now. The last few meters of rope ran out of the cave and then pulled tight on my harness. I gave Olin a minute to finish rigging up his belay, and then gingerly and awkwardly worked my way out onto the vertical ice pillar. Standing on just the tip of my crampon front-points, I reached as high as I could and tapped my left ice tool into the pick hole left by Olin’s earlier passage. 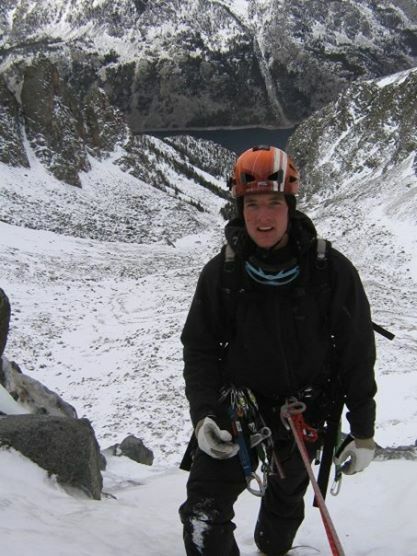 By using the pick and crampon placements he had already excavated and trusting the security of the tight rope, I was able hook my way up the steep pitch of ice quickly. I muscled my way over the final bulge onto a gentle ramp where Olin sat huddled against a small boulder. At the top of Gran Carambano with the cirque and Mystic Lake in the background. I waited until he took the picture, and then reached for the camera so I could take one of him. As Olin knelt to rearrange the anchor for a rappel, I looked back out over the sweeping expanse of snow-capped mountains one more time. This feeling, I thought, this cocktail of adrenaline, isolation, accomplishment, exclusivity, and respect for the mountains and for one another – this is why I climb.